Cajamarca is one of the major cities of northern Peru with a population of roughly a hundred thousand. 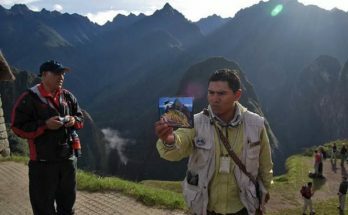 It is the place where the Inka Atahualpa was held captive and had his ransom in gold delivered (after receiving it the Spaniards put him on trial and garroted him). That room is in the church of San Francisco on the Plaza de Armas, one of two large churches on this central square. 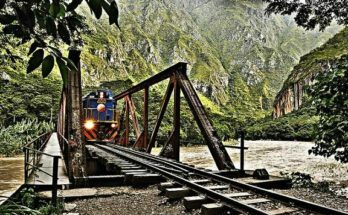 Five kilometers east of Cajamarca in the town of Baños del Inca. It was the hot springs there where Atahualpa tarried waiting to learn more about the armored and mounted Spanish soldiers. Now one can rent a small chamber and take the waters. Also nearby are the Ventanillas [windows] de Otuzco, niches carved into sandstone that were the burial site for mummified corpses in pre-Inka times. We climbed up to them, but there really is nothing to see up there. The niches are clearly visible from the road below. The natural phenomenon of rock spires — which seems cathedral-like to me, but is called Los Frailones, “the stone monks.” –was more impressive to me than the pre-Inka aqueduct I don’t know why anyone would carve out an aqueduct with right angles (zig-zags) rather than curves, but someone did. The aqueduct carries water from the east (Amazon/Atlantic) side of the continental divide west (Pacific) side. Dating the construction is not easy. Claims are made that it dates to 1500 BC and is the oldest still-existing man-made construction in South America, though I don’t believe either of these claims. There are some carvings (petroglyphs). I’m including a photo of one. And rocks that are claimed to be a tomb, though I doubt this. 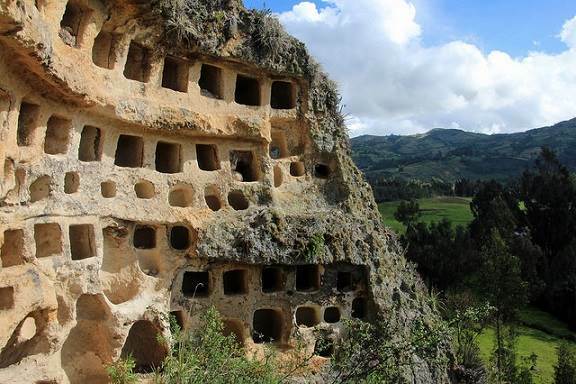 The funerary customs of the Andean peoples did not involve burial, but mummification and placement in cliff sides — like those niches/ventanillas. My posting on the museum at Leymebamba has more, including photos, about mummies paced in cliffside niches and clefts. Some visitors climbed through the “Los Frailones,” massif shown in my first photo here. Indeed, a pair is visible on top, if one looks closely. In northern Peru on a birding trip, there was a “target bird” for Cumbe Mayo: the gay-belliled comet (a hummingbird — one of the more than 138 species of hummingbirds found in Peru, in contrast to one in all of the United States east of the Rockies). There were not many birds, though a mountain caracara (a large carrion-eating bird) was round and about Los Frailones most of the time we were there. We also saw a Bar-winged Cinclodes and a d’Orbigny’s Chat Tyrant. (Peru has a mind-numbing profusion of flycatcher species, too, including dozens of different tyrant speces, many kinds of tanagers, and on and on). Dehydration occurs easily at higher altitude (and men, for unknown reasons are more susceptible to altitude sickness than women), so anyone going to the Andes from lower elevations needs to be sure to carry and drink more water than at lower elevations, and less — preferably no! –. alcohol and caffeine. 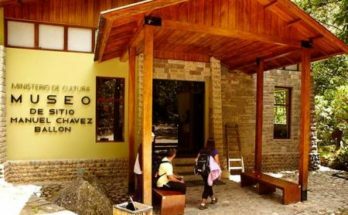 We did not visit the evangelical colony of Granja Porcon or the gold mine Yanacocha, supposedly the world’s largest. There is a zoo at the former. I don’t think casual visitors are welcome at the latter! All in all, I’d have rather started in Trujillo and seen the ruins of the Chimu city of Chan Chan five km east of it… See my forthcoming posting about the Eric Horvath Nature Tours North Peru trip as organized and misled by Eric Horvath.